This isn't quite as exciting as seeing Leno getting pulled over in a Corvette Z06. Unless you have an odd fetish for French cars, in which case, this is quite possibly the greatest video you'll ever watch. Now, how do you change a tire on a DS? It's simple; you raise up the hydropneumatic suspension, put the fixed-height jack stand under the car, lower the suspension and voila! Two tires off the ground without having to use a jack. 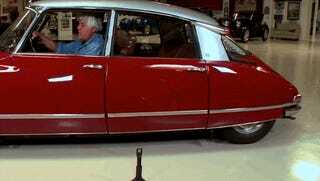 It's neat little things like this that make the DS one of the greatest cars of all time. Leno says that it's both the most innovative, unusual, and comfortable car of all time, and he's not really exaggerating. The DS is the car that defines Citroën to this day, and for very good reason; it was so far ahead of its time, it took years for other manufactures to catch up. Oh, and it's pretty easy on the eyes as well.